These tenacious 14th-century towers defied demolition and are now a fairytale vacation rental. 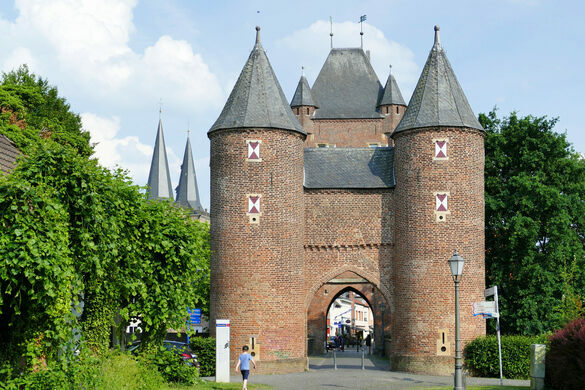 Built in 1393, these are the last remaining medieval city gates in the historic city of Xanten, on the banks of the River Rhine. They’re so well-built that a demolition attempt in the 19th century failed to raze them. The two towers were built by the cities of Kleve and Cologne, which shared administrative responsibility for Xanten in the 14th century. They were once joined together by a bridge over the city’s since-filled in defensive moat. The coats of arms of these cities are still borne on the outer “Owl Towers” of the defensive complex. This pair of round, cone-topped turrets got their avian name after several centuries of disrepair left them a favored haunt for the screeching nocturnal birds. For any would-be attackers getting past this barbican, a second, castle-like fortified tower straddling the roadway offered a final defensive deterrent. By the 19th century, the European fashion for fortified city gates was over, and the structures were considered obsolete relics, fit only for destruction. However, the task of removing the well-built towers proved impossible with the tools available. After defying demolition, the gate’s fortifications were restored and used variously as a prison, museum, local office of the “Hitler Youth” movement, and accommodation for archaeologists working on the Roman ruins located in Xanten Archaeological Park. 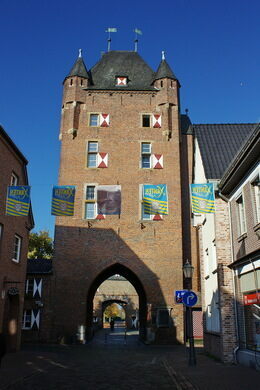 Today, the beautiful city gates are an impressive welcome to this small cathedral city. 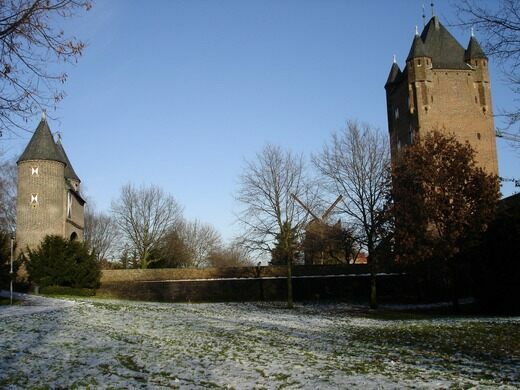 Xanten’s tourist bureau, located a short walk away, has converted the innermost bastion into three comfortable tourist apartments for tower lovers and fairytale-fantasists to stay in. The apartments in the innermost tower can be rented from the city information office or website. Take a walk in a recreation of ancient Rome.